Once upon a time, David Seaman – Arsenal FC’s legendary goalkeeper – was locked away in a cage for smiling too much. 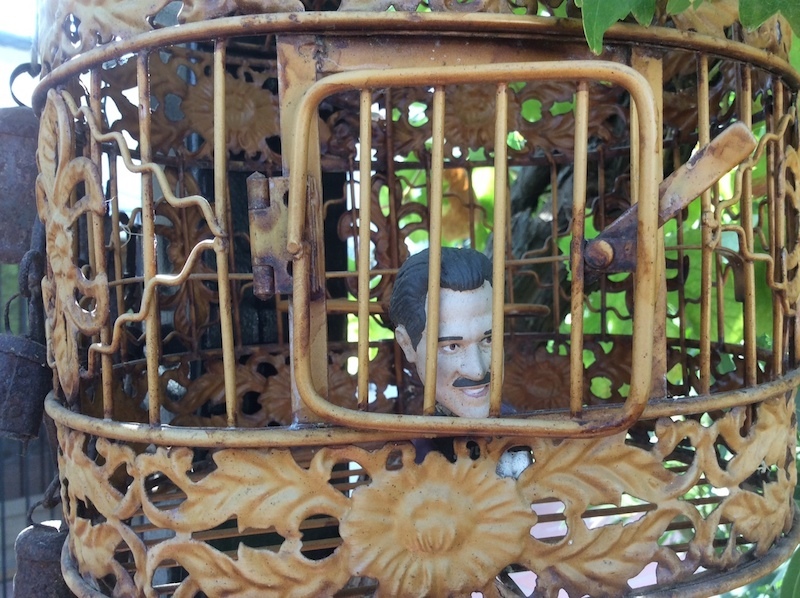 Even in his copper prison, every day he would smile at the birds, insects and cats who passed by. Then, for no reason, he was released, maybe for good behaviour. Free, he was desperate to enjoy his favourite dish: French onion soup. 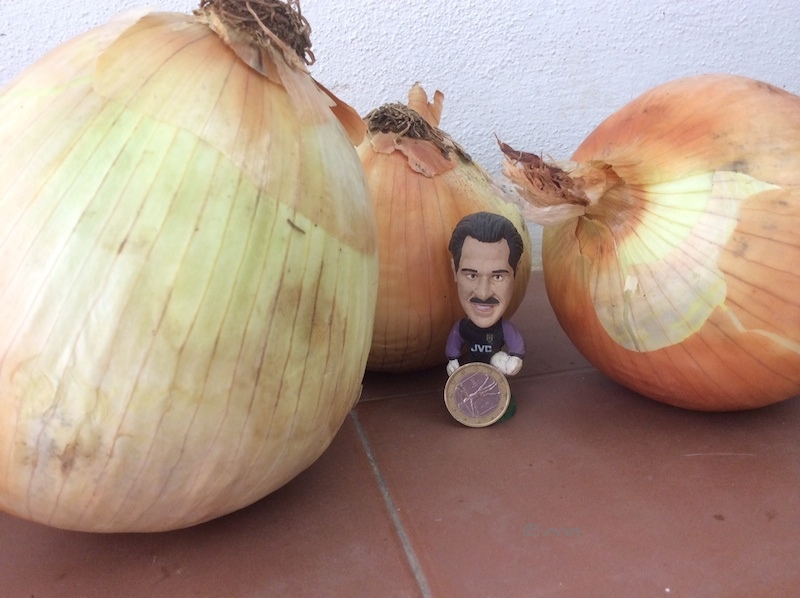 He travelled to Órgiva in Spain and bought the largest onions he could find – one of them 70 times larger than a euro coin. In the sun, with a napkin stained with every slurp, he enjoyed his best meal ever. just read an older post about orgiva market, I,m sure you know by now, but the alpujarra supermarket and Dia both sell very nice ginger. Hi – Yes, we are aware and buy ginger at Alpujarra supermarket. They also sell fresh coriander but don’t have it every day. Have you been buying some funny cigarettes from those weird types in Orgiva? Would never dream of it – and no one is ‘weird’ here – just different! Spanish onions – especially large, sweet ones – are perfect for French onion soup as they caramelise well – and David also needed some pants which the market supplies in vast quantities. It is a large onion though, isn’t it? A football commentator once said of a forward with a goalscoring opportunity: ‘He has Seaman all over his boots’. Make of that what you will. Everyone has their heroes – and sometimes, they turn to onions. How many glasses of cava with pomegranate seeds? You don’t understand how important Arsenal FC is in this household. The man is a legend and M once droned his name (Seeeeeeeeeeeeaaaaaaammmmmmmaaaaaaaan) for 23 seconds at Highbury. We have proof. Did you just write a sensible reply to my flippant comment and put it through Google translate…?